Print up to 13" × 19"
The Canon imageRUNNER ADVANCE 6500 III Series are durable black and white multifunction printers are designed to meet today's demand for integrated imaging, cloud, and mobile solutions by delivering high quality output and offering a range of diverse finishing capabilities. With an emphasis on maximizing uptime, enabling high print volumes in a multi-user environment, powerful scanning capabilities, intuitive usability and an increased focus on user authentication, these monochrome laser multifunctional printers provide a solution for your most diverse and complex large volume printing and scanning needs. 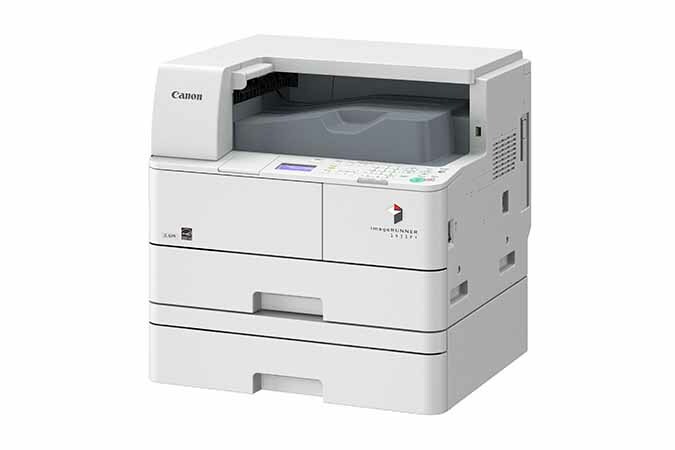 Canon imageRUNNER ADVANCE 4500 II Series black and white models are designed to deliver consistent and reliable performance to your busy departments and work environments. With an efficient, compact design, these intelligent systems work seamlessly within fleet environments, offer an intuitive user experience, and integrate with Canon’s holistic business solutions to help address your needs. The imageRUNNER ADVANCE 715iFZ II Series is designed to deliver consistent, reliable performance with advanced capabilities in a compact design. These intelligent systems offer an intuitive user experience, work seamlessly within fleet environments, and support Canon’s holistic business solutions to help address your needs. Up to 8-1/2" x 14"
Small businesses and corporate workgroups depend on solutions that help maximize resources, boost productivity, and are easy to manage. The cost-efficient imageRUNNER 1435+ Series can do all that, and more. With fast output, scanning, faxing, and high reliability, these multifunction devices help you accomplish a lot in a small space.